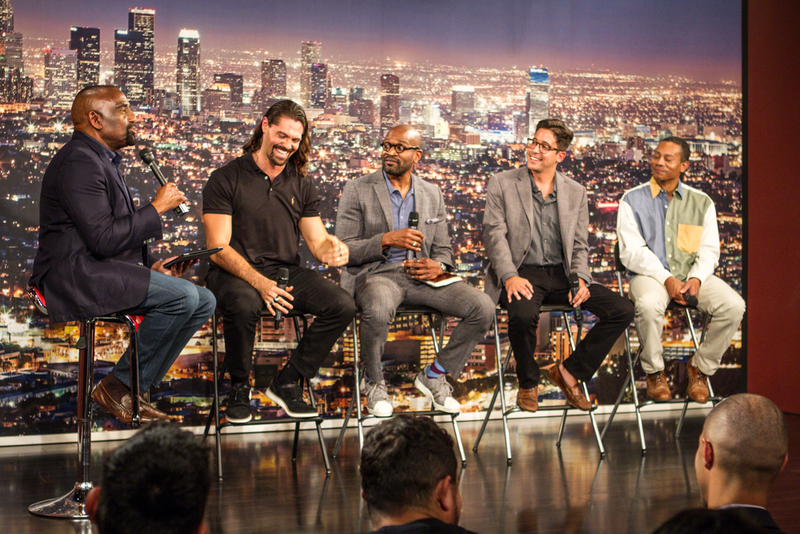 This is just a small sample of what men had to say about BOND’s 9th Annual Men’s Conference held in Los Angeles over Father’s Day weekend. The event kicked off with a performance by comedian Darren Carter, who has performed on “The Jay Leno Show” and Showtime. Darren was firing on all cylinders, and he did a great job entertaining the crowd. Then, there was a panel discussion featuring Alexander J.A. Cortes, writer and personal trainer; Steve Burt, small business and real estate attorney; Michael J. Knowles, author, actor and host of “The Michael Knowles Show” at the Daily Wire; and Renaldo Strayhorn, Ph.D., a Licensed Marriage & Family Therapist with a practice in Los Angeles. BOND Founder and President, Jesse Lee Peterson,was the moderator for this event. The panel engaged in lively and thought-provoking discussions on the true meaning of manhood, alpha vs. beta males, and how to achieve spiritual, family and financial success. Then, the panel transitioned into a conversation about race and whether racism really exists or has ever existed. Next up was speaker Mike Cernovich. Mike is a journalist, filmmaker and author of “GORILLA MINDSET.” He has reported from the White House and has broken major stories. Cernovich gave a brief introduction about himself, and discussed the attack on freedoms—especially the attempt to silence conservatives. He also took questions from the audience on various topics including effective ways to fight the culture war and how people can bypass the corrupt mainstream media to get the truth out. Cernovich encouraged the attendees to stop thinking about their ideas and to take action. “Start doing now and don’t judge yourself based on comparing your work to someone else who has been doing it for years,” Cernovich said. He told that audience that they’d be stunned by the modest beginnings of some of the most successful businesses and online media personalities today. Then, Jesse Lee Peterson hosted his popular open forum which allows the audience to ask questions and discuss personal issues and challenges they’re struggling with at home or at work. People came from all over California, and from states like Illinois, Arizona, Nevada, and even from Canada and Switzerland. Some of the guys had issues with anger, depression, and marital problems. One man from Las Vegas talked about how he was able to overcome serious emotional issues as result of putting into action the principle of forgiveness. As a result, he got off medication and said he feels one hundred percent better. An elderly man from Jamaica, whose son brought him to the conference, talked about being physically attacked by his wife. He was slightly embarrassed to admit it, but he said the wife has become so jealous of the relationship he now has with his son that she routinely assaults him and then threatens to call the police if he tries to defend himself. Jesse encouraged the elderly man (and others facing similar situations) to immediately call the police and have the wife or girlfriend arrested the next time this happens—it will send a clear message that there’s zero tolerance and women can’t get away with hitting men. Great speakers, entertainment, and bold and honest dialogue with men of all ages and races—it was amazing! The event concluded with dinner catered by Komodo Cafe and more great conversations. IRS Problem Solvers; Seton and Associates; The Matthew 25:35 Foundation; and Shottenkirk Desert Lexus. BOND (The Brotherhood Organization of New Destiny) is a nationally recognized nonprofit dedicated to “Rebuilding the Family by Rebuilding the Man.” Founded by Jesse Lee Peterson in 1990, BOND operates various programs and services designed to help men and families. They offer counseling, mentoring, monthly forums (for men and women), weekly church service, an Entrepreneur Academy for boys, and community forums. BOND doesn’t accept any government funds and relies on donations to operate its programs and services. TO DONATE, CLICK HERE.